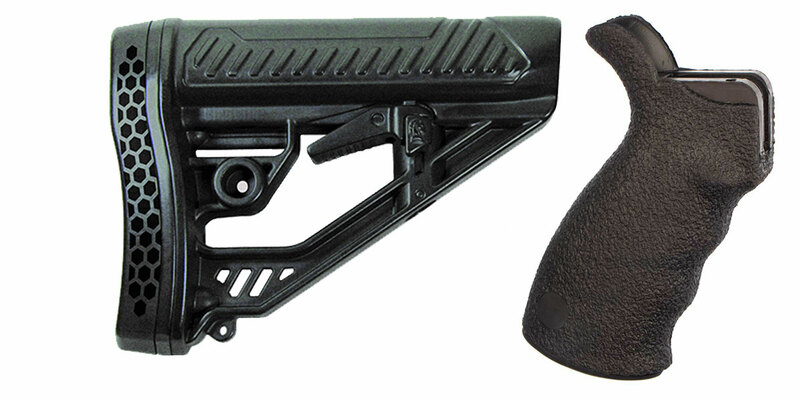 This Combo Includes An Adaptive Tactical Adjustable Stock. With An Advanced Design, This High-Impact, Polymer Construction Makes The EX Performance Adjustable Stock The Ideal Upgrade For Your AR-15 Or M4. The EX Performance M4-Style Stock Features An Easy-To-Reach Rapid Adjust Lever For Custom Length-Of-Pull, And A Molded In Non-Rust Standard Sling Swivel Attachment Spot. Durable Polymer Construction With Non-Slip Vented Rubber Recoil Pad, Oversized Extra Strength Adjustment Pin, And Sleek Industrial Design. This Combo Also Includes A Blackhawk Ergonomic Grip. This Ergonomically Designed Pistol Grip With Finger Grooves Is Comfortable, Prevents Fatigue And Aids In Controlling The Weapon Even When You Wear Gloves. The Aggressive Textured Grip Surface Minimizes Slippage And Is Virtually Impervious To Oils And Solvents Used On Firearms.